Is the SINGER 191D-30 the best Singer industrial sewing machine? This review will take an in-depth look into the machine so that you can find out. You should understand that conventional sewing machines cannot reliably handle the demands of bulk sewing that involves heavy fabrics. Even for light fabrics, you cannot depend upon domestic sewing machines for continuous sewing operations that last for several hours each day. If you try to push your domestic sewing machine to the limit, you will soon notice funny sounds. These sounds would be the machine groaning under the load. There may also be a burning smell and the motor will eventually burn out if you persist. The motor is not powerful enough for heavy operations. It also lacks the special lubrication system that is required for the motor to work for long hours. So, for heavy fabrics, long operations and ultra high stitching speeds, you need to use the best Singer industrial sewing machine. Although they might look rather similar superficially, industrial sewing machines are different from home sewing machines in several ways. 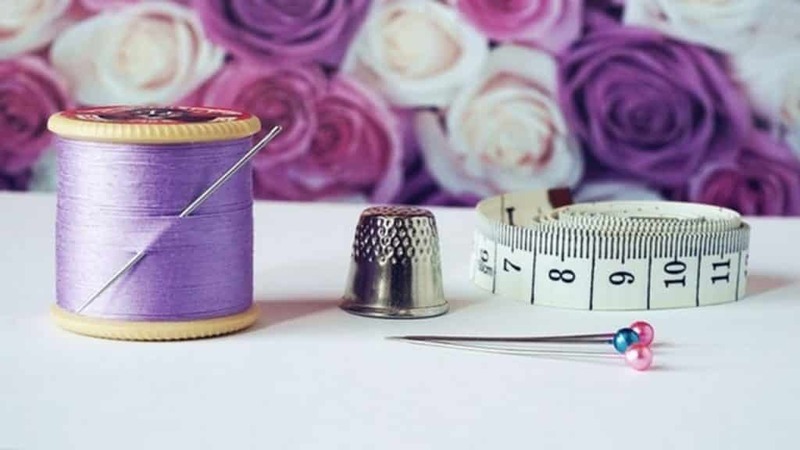 Since industrial sewing machines are built for long term use, bulk output, and professional use, they are constructed with superior quality parts, motors, and stands. Since traditional sewing machines are built for light use, they can even include plastic gears and parts. On the other hand, industrial sewing machines will use aluminum or cast iron for its housing, connecting rods, gears, and body. These construction details make industrial sewing machines sturdy options, not just for the mass production of apparel but also for shoes, bags, sofas, seats, car upholstery. 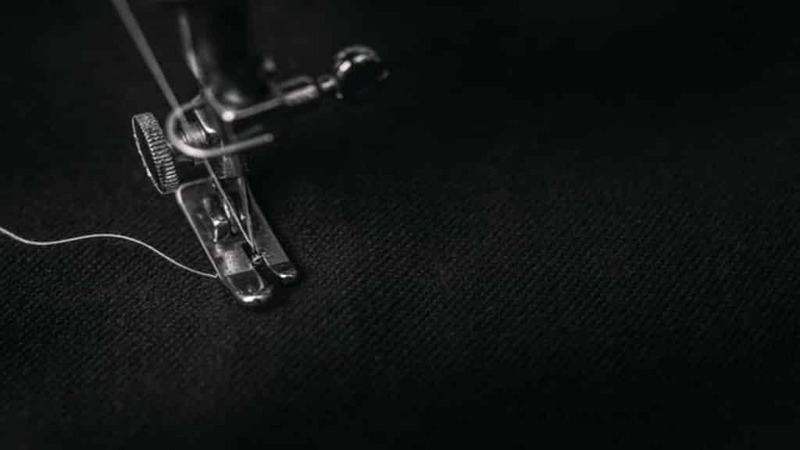 Since the stitching mechanism must be enduring and dependable, industrial sewing machines are often for just one stitch type. In most cases, it is the basic straight stitch for simple straight seams. There are also models for sewing different types of stitch patterns such as the zigzag seam. There are even industrial sewing machines that are specialized to just sew and produce buttonholes. Conventional machines offer several stitch varieties. Standard sewing machines often operate at a power of around 65 Watts. Heavy duty sewing machines often have a motor that is around 60 percent more powerful than the standard variety. This means that heavy-duty sewing machines can take up around 100 Watt power and their stitching speed can go up to 1,200 stitches per minute. These figures are dwarfed by mighty industrial sewing machines which operate at 400 Watts. It is not uncommon to have stitch speeds of 4,000 revolutions per minute. This speed can go up to 5,500 stitches per minute and even higher. Since such speeds are comparable to the rotational speed of your car engine, industrial sewing machines require specially designed self-lubrication system to minimize friction and wear. Special attention must also be given to minimize the noise levels since the motor operates at very high speed and power. This is one of the most common varieties. Flatbed-type industrial sewing machines closely resemble ordinary sewing machines since the needle and arm extend towards the machine’s flat base. The flatbed type sewing machines are typically used for sewing together flat fabric pieces. This is the category to which the best Singer industrial sewing machine belongs. These sewing machines employ a horizontal and narrow column in contrast to the flat base. Fabric can, therefore, be passed under and around the column. The cylinder-bed diameter lies between 5 cm and 16 cm. This machine is commonly used for mass production of cylindrical items like shirt cuffs, as well as bulkier items like shoes and saddles. These industrial sewing machines feature a vertical column that has loopers, feed dogs, and bobbins. The vertical column rises over the machine’s flat base. The column’s height can lie between 10 cm and 45 cm. The post-bed machine is utilized for those applications where access to the sewing is restricted such as boot making, glove making, and attaching emblems. In this type of industrial sewing machines, the material is fed by workers in line with the horizontal column’s axis. This type is used in applications like shoulder seams and sleeves. The SINGER 191D-30 is the best Singer industrial sewing machine that is ideal for industrial crafters, tailors, high-volume domestic garment makers, seamstresses, designers, and home decorators. It includes the most basic stitch – the straight stitch – since this has been specially designed for industrial use. As the machine specializes in only straight stitches and does not produce any other fancy stitches, it has a simple and enduring mechanism that will stitch with great precision. Since this is an industrial grade sewing machine, you can expect very consistent stitch quality. You can say goodbye to skipped stitches, bunching, and other problems. The needle bar is set up in perfect and rigid alignment. This prevents wobbly stitches which commonly appear in less robust conventional sewing machines. The needle plate has been specially designed to make it perfectly suitable for all type of fabrics including the delicate variety. You can set the stitch dial to its maximum position for a maximum stitch length of 5 millimeters. Customizing stitch length is very easy indeed. The industrial strength motor of this high volume sewing machine operates at very high speed and power. At 0.5 horsepower, it would be fair to call this the best Singer industrial sewing machine. The heavy-duty motor is built to last – it can provide reliable operations for several years and is, therefore, well worth your investment. It is about 5 times more powerful than other domestic sewing machines. It can reliably sew multiple layers of fabric at high speed. With so much speed, you can complete even large sewing projects in relatively less time compared to other ordinary sewing machines. Since this industrial grade machine can operate at a maximum of 4,000 stitches per minute, even high volume projects will be finished quickly. The high strength motor works efficiently and reliably, thanks to a special self-lubrication system which is fully automatic. The motor is embedded in an oil reservoir. Oil circulation is made possible by a powerful centrifugal pump which allows the motor to self-lubricate. The lubrication system will keep the extra high power motor fully dependable and functional for several years to come. With these features, you can easily expect the motor to last for several decades. The sewing machine will prove to be a true blue companion for several years to come. With the knee lifter, it is possible to lower and raise the presser foot hands-free for maximum speed and convenience. In order to sew multiple thick fabric layers, this feature will prove to be very useful. Since the knee-lifter is extra high, you can sew much thicker multiple layers of fabric very quickly with this machine. You will enjoy an extra high lift of 13 mm (half an inch) which is much greater compared to ordinary sewing machines. There is also great flexibility because you can also choose to work with conventional presser foot lifter. This will give you the standard lift of 5.5 millimeters (0.22 inch). You can sew all types of heavy fabrics including upholstery. Sewing through several layers of denim is a breeze with this sewing machine. This is another reason why it is the best Singer industrial sewing machine. The reverse layer can also be used to ensure high stitch quality, reinforce the seam ends, produce strong stitching, and prevent unraveling. You can also wind bobbins while you are sewing by employing another spool pin which is stored towards the rear of the machine. With the help of this feature, you can save your time through efficient loading since a spare bobbin is always ready for you. The sewing area is extra large so there will be no shortage of space and no overcrowding. This can be an annoying factor for conventional sewing machines. You can now easily manage bulk output and large projects, thanks to its extra long 11.75 inch-arm of this machine. You can readily adjust pressure that the presser foot applies on the fabric. By just turning the dial, you can customize the pressure. This will allow you to sew all sorts of fabrics including the heaviest denim and the lightest tricots. The stout frame provides a robust structure that acts as a rigid foundation for the sewing machine. The stand is composed of specially designed h-legs and its height can be easily adjusted. Laminate surface ensures high durability so that the stand will last for many years. The sewing machine will be delivered to you in a completely assembled state. The complete assembly includes the motor, the stand, and the machine head. It will be transported to you in a wooden crate. Since the full assembly has a weight of 211 pounds, it will have to be lifted by a number of people. The large area of the table top measures 50 in. by 22.5 in. This makes it a spacious workstation that won’t leave you cramped for space. The generous surface area will prove to be completely sufficient for all your sewing needs. All the necessary accessories have been included inside the storage drawer which is located below the left side of the assembly. The accessories include the straight stitch foot, three screwdrivers (small, medium and large), oil container, machine rest pin, and three bobbins. 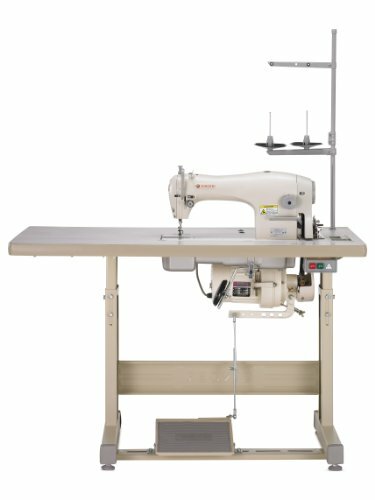 This is one of the top-notch machines with a high reputation in the industry for durability and consistent stitch quality. The striking feature about the machine is that it operates very smoothly despite its high power consumption. Industry professionals and high-volume home crafters will appreciate how vibrations in the rigid assembly are kept to a minimum, allowing them to work in comfort. Singer is one of the most recognizable brands in sewing machines. For several decades, Singer has set the benchmark for different types of sewing machines. The company has a distinguished history of innovation which includes the first computer-controlled sewing machine, the first zigzag pattern sewing machine, and the first portable sewing machine. The high level of proficiency and technical expertise of the company dates back to 1851 when the company was founded by Isaac Merritt Singer. By 1860, the company had become the largest manufacturer of sewing machines worldwide. 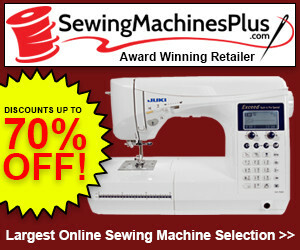 Today, the company is the industry leader and the most trusted name in sewing machines. Singer sewing machines are renowned for reliability, flexibility, and ease-of-use. Whether it is dressmaking, quilting, embroidery or home décor, Singer sewing machines are allowing people from all over the world to express their creativity through the art of sewing. Since the SINGER 191D-30 is powerful, durable, and consistent. It is the Best Singer Industrial Sewing Machine that tailors, professionals, industrialists, and seamstresses must consider for high-volume sewing work involving heavy fabrics.